Here's something you probably didn't know about me....I'm inked! I have only two tattoos but I would love to get another one (or more!)! Why are they so addictive!!?? This one is on my back...I love it, but my only regret is that I can't see it!! In fact, sometimes I forget it's there and it startles me when I catch a glimpse in a mirror! This one is on my ankle...it is from ages ago, it's the astrological glyph for leo! Click here to see what others are writing for the Blogging from A-Z Challenge for the letter I! I have only seen my 'tramp stamp' a couple times - once in the tattoo place when it was done and once last year when Russell held up a mirror to it. I forget it's there too until he sees it and goes, TRAMP STAMP! TRAMP STAMP! I also have a Grateful Dead dancing bear on my ankle. My youngest stepson didn't reveal his ink to his father till he saw that I had ink on my ankle....I guess he felt safer showing it off, knowing that his dad didn't object to mine. 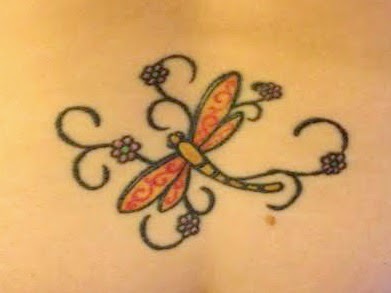 That dragonfly and the swirls surrounding it is so joyful and free! Love your ink Amy, I have two also one on my back left shoulder of a flying unicorn and one on my left side calf of a fairy. You know, a lot of people really like them. Me, I'd be afraid of the needles.